Charcoal dark tones hare ‘ Watch It’! After a hectic week, I have eventually managed to grab hold of the charcoal to have another play, it has been long waited, I had really enjoyed it previously and I think the willow stick was jumping out the box to give me black fingers ……and it did just that as I really went mad with the black! I have decided I need a better putty rubber, although I bought a new one, it was not great for the job, it was not very pliable, stretchy, or even erased that well……now on the hunt for a good one, any suggestions, I have heard FCastell is ok? I Used my new pad of mixed media paper by 169lb by daler rowney, I am very pleased with the quality for the price, it worked pretty well, but not quite as well as on the pastel paper by daler rowney ( I could not afford a large pad of pastel paper). 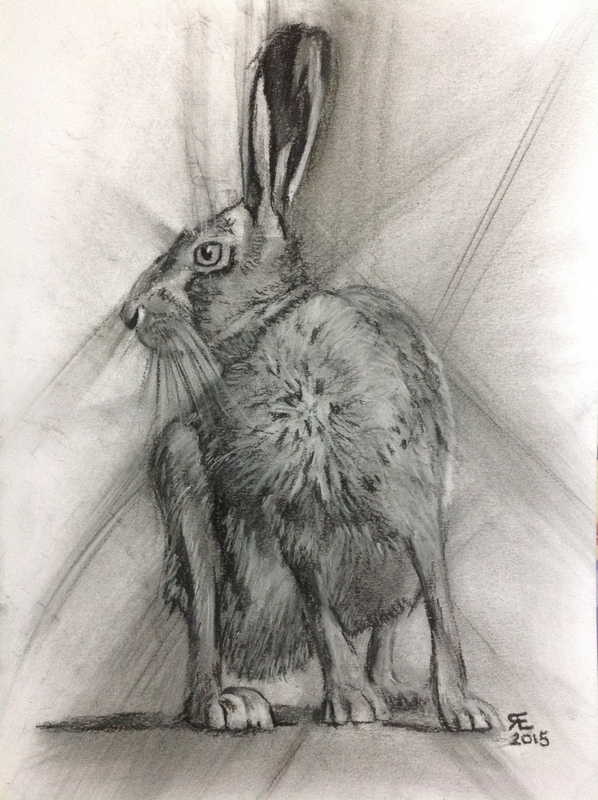 This entry was posted in art, Charcoal, Drawing, Hare and tagged art, Charcoal, drawing, Hare, painting, Painting. Bookmark the permalink. 5 Responses to Charcoal dark tones hare ‘ Watch It’! I really did make quite a mess……I wanted this trial to be much more blended, which caused too much loss of whites, finding this eraser may be more of a problem, is it even out there? Or maybe it is technique……keep practicing I guess. Yes, I think that’s the only solution. Great energy. He is about to hop off the paper! Thank you. Now that would be great, I would love a real hare, I have considered getting a Belgian hare ( which is really a rabbit) but I have a cat that is keen on rabbit snacks! And a dog that probably would not be a good mix 😕 if I had one I would like it to run free more than locked in a cage. Maybe one day?